You may have noticed it’s been a bit quiet around here. You may also have noticed a number of photos from Hampshire and Sussex popping up in my sidebar. It doesn’t happen often, but yes we’ve been on holiday. Now I’ve had a few days off, I’m raring to go again and eager to share some of the highlights of our travels. Don’t worry, they’re not too extensive. Lymington in Hampshire is a really pretty town on the edge of the New Forest and just across the water is the Isle of Wight. We’re very familiar with it as CT’s mother lives there. As we were staying for a full week this time, we decided to take a jaunt to East Sussex and spend a couple of nights in Hastings. We’ve never been to Hastings before and we weren’t too sure what to expect. Well, we were very pleasantly surprised. East Sussex is a beautiful county. This is quintessential England. Coming from Cornwall, I just couldn’t help but be open mouthed at the abundance of trees and woodland. Gently rolling hills and chocolate box villages were the order of the day. The gardens too are quite beautiful. We visited three, one en route for Hastings, one whilst we were there and one on the way home. They were all very different, but stunning in their own individual way. Sheffield Park is a National Trust property with a massive acreage and extensive water gardens. It’s more of an arboretum with lakes, than a garden in the traditional sense and it has an impressive house standing sentinel. In Hastings we were lucky enough to get a private tour of the organic gardens at Fairlight Hall. It has a couple of long ornamental borders, a tropical patch, a walled fruit and vegetable garden, amazing views and an impressive mock Tudor mansion. We came away with greenhouse envy, walled garden envy, raised bed envy and productivity envy. Whilst we were there, we met up with a friend who took us to a gastro pub for dinner. The Crown is in the old part of Hastings and close to the sea front, so we got to experience a bit of night life as well as having a fabulous meal. The Crown gets some of its herbs and vegetables from Fairlight Hall, so I knew we were in for a treat. I wasn’t disappointed. I had a choice of two vegetarian dishes and they both sounded appealing and interesting – no veggie lasagne or goat’s cheese tart in sight. I had herbed gnocchi with pesto and roasted cauliflower. It was fresh, vibrant and very tasty. The others really enjoyed their choices too. For pudding I had a walnut and caramel tart whilst the others enjoyed a plum frangipane with plum sauce and custard. Sadly, I didn’t manage to get any photographs other than the gnocchi on the top photo. Whilst in Hastings, we enjoyed leisurely holiday breakfasts in our B&B, explored Alexandra Park, drank copious quantities of Pimms and walked around some of the extensive Nature Reserve. The temperature was high and it was very humid, so we didn’t do the walking we might otherwise have done. Nevertheless, we got a good flavour of what the area had to offer and we were impressed. Before heading back to Hampshire, we just had to visit Great Dixter, Christopher Lloyd’s famous garden. CT rather sheepishly admitted that he’d never been there before, despite having read many of Lloyd’s books. I think this might have been the hottest day of the whole holiday, indeed the whole summer. Despite the heat, however, we managed to stagger around the riotous plant packed gardens which were a kaleidoscope of colour and form. There were so many vibrant blooms, I was like a kid in a sweet shop and didn’t know where to look first. I was particularly taken by the dahlias and roses, which weren’t nearly as wilted as we were. The aged red brick buildings, including barns and oast house were just adorable. Back in Lymington, we met up with a friend, ambled about and sought shade wherever we could. We visited Miss Witt and her sumptuous water ganache chocolates at the weekly market; it had to be done. We also tried some birch water in the, new to us, Scandinavian Österbox cafe, ate my rye sourdough with vanilla apricot jam and discovered fairies living in the park. Well, we were on holiday. What a brilliant trip you had! I would love to visit these places. Lovely to see photos with so much sunshine. What beautiful places you have visited. There is so much to see and do outside of London. Haha indeed there is Nayna 🙂 The wonder of Sussex is that it’s so easy for Londoners to do day trips. It looks like you had a really lovely time 🙂 I have added most of these places to my ever-growing ‘to visit’ list! We had a great time thanks Kevin and if you haven’t been to that part of the country before, it’s definitely worth a visit. What a perfect holiday…. just my kind of thing too! Something I really love about your photos is the amount of flowers and plants you share – wonderful! That rye bread looks smashing, by the way – I could so eat some of that right now! Thanks Nico. I do love nature, plants and gardens, so I guess it’s no surprise it’s reflected in my output. I’ve been making rye sourdough for nearly seven years now and would be lost without it. What lovely places! So much to see and do! Your photos are all so gorgeous. It looks like you had great weather too. Thanks Nayna. It was a bit too hot for me, but it was great to see blue skies and still heaps better than rain. There are so many great mini-breaks and holidays to have in the UK. 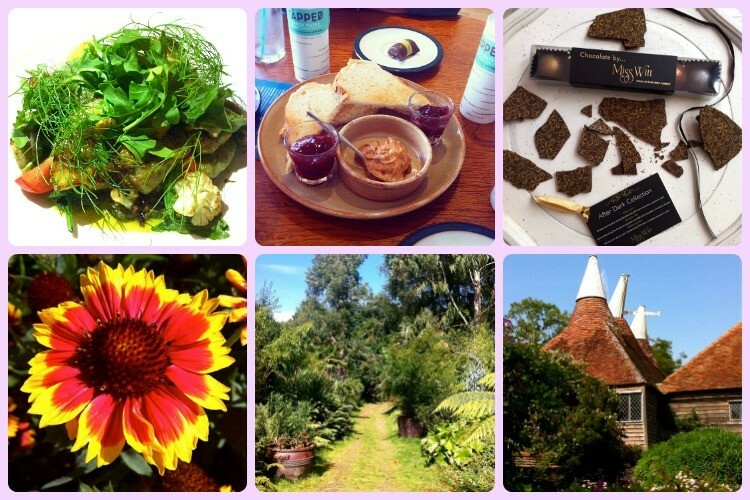 We spent a weekend on the Isle of Wight and really felt we had been on holiday! Ah yes Heidi, the Isle of Wight is lovely. We could see it clearly across the water from Lymington.